This year’s Fantastic Arcade is happening right now, so if you’re in Austin or a short drive away (n.b., a “short drive” in Texas is anything under 8 hours), you should go. Admission is free, gas is cheap, and Shine Boch actually tastes good if you drink it in the Lone Star State. There’s a complete schedule of events here. Festivities started on the 22nd and run through this Thursday (the 29th). 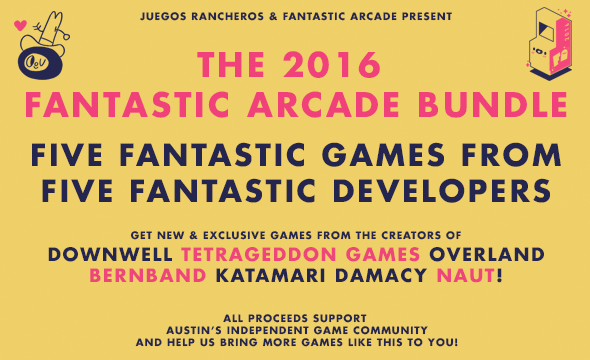 If there’s a tear in your beer (Shiner or otherwise) because, like me, you can’t go, you can play the games of Fantastic Arcade (some of them) at home with this itch.io bundle, presented by Juegos Rancheros in conjunction with Fantastic Arcade, and benefiting the Juegos Rancheros nonprofit. Unlike Fantastic Arcade itself, the bundle’s not free, but for $15 you get five new games by Moppin, Takahashi, Saltzman, Klondike, Lawhead and SOKOP. Viva los independientes! Both a new Humble Bundle and a new Indie Game Music Bundle have come out this week (coincidentally, as they’re otherwise unrelated). The Humble Bundle includes Bastion, Amnesia: The Dark Descent, Psychonauts, LIMBO, and Superbrothers: Sword & Sworcery EP. The Indie Game Music Bundle includes the OST’s of Terraria, Plants Versus Zombies, Dustforce, Ilomilo, and Frozen Synapse (plus much more if you pay over $10).